Heat three tablespoons of oil in a large casserole on a medium-high flame. Fry the shallots for three to four minutes, stirring regularly, until well browned, then remove from the pan and set aside Keep the pan on the heat. Heat the oven to 335 degrees fahrenheit. Wipe the casserole clean and return it to a medium heat with the remaining two tablespoons of oil. Fry the ground cumin for a couple of seconds, then add the dried mint, rice and 1 teaspoon of salt. Stir to coat the rice in oil, then pour 3 cups of the strained cooking liquid. Return the shanks to the pot (stand them up in the rice, if you can), add the reserved cinnamon and fried shallots, cover and bake for 30 minutes. Meanwhile, whisk together the egg and lemon juice in a small bowl. Pour 1/4 cup of the remaining stock into a small saucepan. Bring to a boil, then slowly whisk the hot stock into the egg and lemon mix. 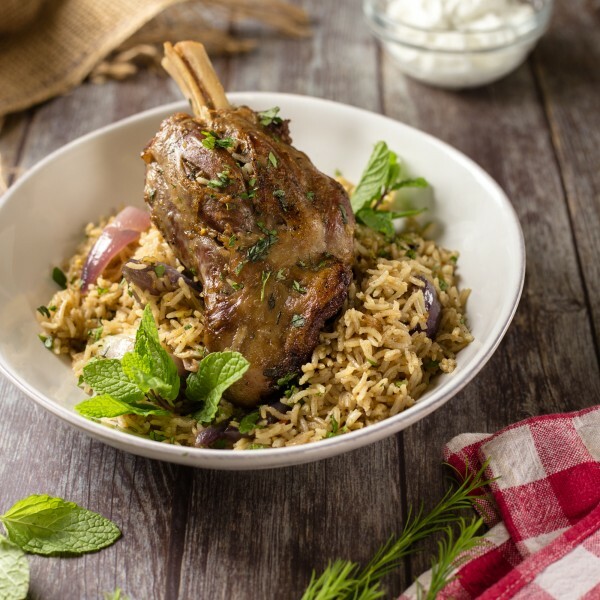 Remove the lamb pot from the oven, pour the egg mixture evenly over the meat and rice, sprinkle over half the herbs and take to the table. Serve from the pot, adding the remaining herbs as each portion is plated. I like to eat this with a big dollop of Greek yoghurt.